Fans of Snooker may be disappointed about the subject matter of the Big Break Poker machine, as it's nothing to do with the game, but the rest of us will delight in the relaxing tropical scene that unfolds on the reels. 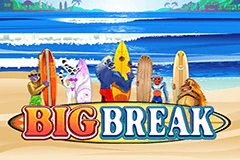 Filled with exotic fruits, surfing monkeys and a backdrop of waves lapping the beach on an island, Big Break comes from Microgaming, and like all of their games, it's guaranteed to be fair to players, while no download is needed to play either on a desktop PC or mobile device. It's laid out over 5 reels, and there are 15 paylines, with players able to wager just 0.01 on a spin, or up to 75.00 a go. Naturally wagering on just a single line will only bring in a prize if the symbols line up on that one, missing out if any of the others land a winning combination, so the advice is always to have at least something on all lines, otherwise the reels will be spinning for a long time before anything exciting happens. Whatever the wager, the excitement starts when at least 3 identical symbols land across a line, starting from the left column, with winnings quickly increasing if 4 or 5 land in the right spots. The avocado, kiwi fruit, coconut and banana are the lower value symbols, with prizes from just 5 coins for 3 of the coconuts, up to 150 coins if the banana fills an active payline. Monkeys equal money here, and there are 5 of them in total, each rendered in a cartoon style and pulling a cheeky face, but while the graphics may not be state of the art, they certainly give the game some visual appeal. Payouts go up to a nice 1000 coins with the most valuable primate, and to add variety to the run of play, there are some special symbols thrown into the mix as well. Any monkey symbols that are part of a winning combination become animated, revealing them to be surfing, meditating or in the case of the lemur, dressed in a purple bikini, which just looks wrong somehow. Two symbols act as wilds here, with the Big Break logo substituting for the monkey symbols only, so players getting 2 of any identical monkey symbol and the wild on a line will still get a prize. The Lucky Break symbol only appears on the fifth reel but substitutes for all symbols bar the Big Break and scatter, and when a win is created this way, the amount paid out to the player gets doubled in value. In the base game, there's a single scatter symbol, which gives players the first hint of the surfing theme that crops up in a bonus round. The tin of Munkey Wax works as scatters tend to, by rewarding players with a prize that's a multiple of the total bet per spin, not the coin value. In this case, just 2 scatters equals a 2x payout, while 5 of them landing in any positions will boost the bankroll by 100x the amount wagered. Between 3 and 5 scatters will also see a free spins game begin, with 15 spins awarded, and all the monkey symbols acting as scatters throughout. This means that should they appear on a line from right to left, or left to right, a win will be paid, which should lead to some extra prizes during the round. Those friendly monkeys will also lead players to the Surfs Up bonus game when 5 examples of the same one land anywhere across all 5 reels at once. It's a quick round where players need to click on the surfing monkeys for a nice multiplier prize that goes from 15x the triggering bet up to 50x for stopping on the gorilla. Go Ape or Wave Goodbye? Big Break is a nice all-round pokie, which looks pretty good while not being overdone with flashy graphics, plus the bonus rounds are pleasing enough and seem to pop up fairly often. The inclusion of 2 wild symbols may be a little pointless, although there's no real disadvantage to this, so anyone playing at online casinos using Microgaming software should give this one a go.